My driver has Pul+,Pul-,Dir+,Dir-,Ena+,Ena-. Which GPIO pins should I connect to my Raspberry Pi 3. and how can I connect my M542T to Raspberry Pi. I couldn't find any example has done for this drive how to connect the raspberry pi. Is there any guild how the GPIO pins work on this drive, please. I just need to know where Pul+, Pul-,Dir+,Dir- goes to the raspberry pi or the GPIO pin connection. This is a good source of info on how it can be done on an Arduino (you can see the GPIO equiv wiring); should be a good starting point. 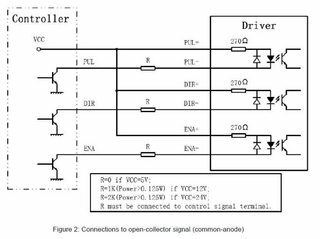 Looking at the manual for this stepper motor driver, it requires a 5v drive signal as the inputs are buffered via an opto isolator, So I don't think you can drive it directly from the pi gpio 3.3v. 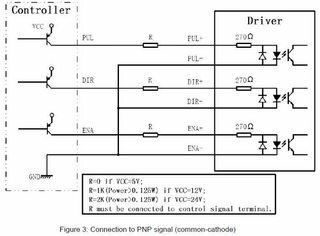 the 2 example ways of driving the inputs on the motor driver taken from the manual. the simplest option would be to use some 2n2222 transistors between the pi and the motor driver. which gpio you use to drive this is up to you but you could use gpio 17,27,22 or gpio 16,20,21.